There are only a few more days to submit your art to the Manhattan Arts International juried online exhibition, "Celebrate the Healing Power of Art". The exhibition will promote artists who have created their art for their own healing journey or the healing of others. 50 artists internationally will be chosen and exhibited online with additional prizes and exposure for several finalists. More details can be found on the Manhattan Arts International blog: www.manhattanarts.com/Gallery/Healing-Power-of-ART. Dynasty has a vested interest in Manhattan Arts International, awarding one finalist a bouquet of brushes worth over $200. More details to come on the finalists and the show once the winners are selected. Gouache -- think velvety, opaque watercolors. Sounds a bit like an oxymoron, but gouache (pronounced gwash) is a medium all its own with a lovely matte finish and workability until it is fixed or varnished. P.C. 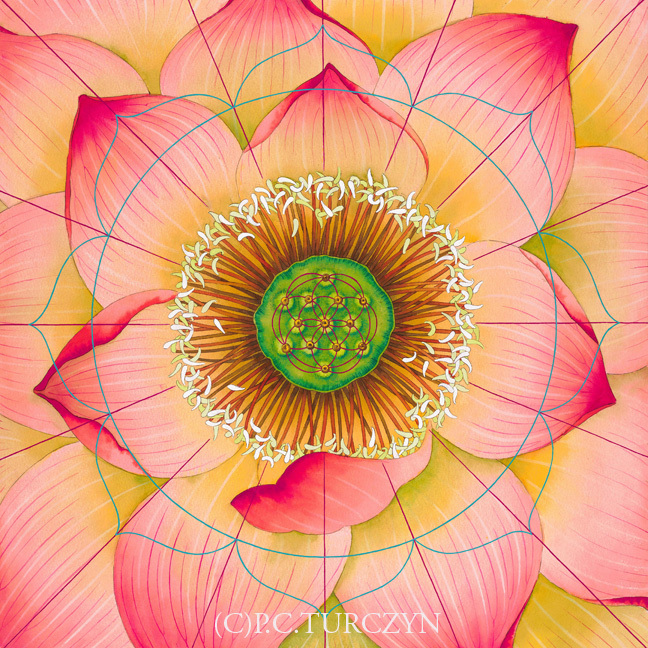 Turczyn, our Artist Spotlight from last week works her beautiful mandalas in gouache because of their brilliant color and smooth application. Gouache was originally a term used to describe the technique of painting oils over a tempera underpainting, back in the 16th century. Much later, in 18th century France, gouache became the name applied to opaque watercolor paint. Gouache is opaque when applied to a substrate, covering the white of the surface. It is created with either opaque pigments and a gum arabic binder, or created with translucent pigments and added chalk plus the binder. There is a significant difference between student and artist grade gouache paint; take note that the artist grade will have a higher pigment concentration and usually more range in colors. Gouache can be reworked on paper when re-wetted, but will stay fixed once sprayed with fixative or varnish. The paint is very useful in design or illustration because it dries to a matte finish and can be used to make prints easily. Acrylic gouache is a different formula that gouache as the binder is an acrylic resin rather than gum arabic. It will be water resistant when dry and stick to a variety of surfaces. Gouache has been primarily manufactured for the use by designers and illustrators, hence the namesake "Designers' Gouache". Some of these paint lines have hues that will fade with exposure to light due to the pigments used. Be wary of these colors if you are creating art for posterity and stick to brands and colors in particular that conform to ASTM D5724, a quality labeling standard that confirms the colors have been lightfast tested. Since gouache works on a surface like watercolors, watercolor brushes like Faux Kolinsky, are appropriate for application. However, gouache does beautifully in dry brush techniques and a bristle brush or springy brush like Interlock Bronze would do well for this type of application. New York artist, P.C. Turczyn began her interest in both art and healing early in life and pursued both practices at different times in her professional journey. With a degree in textile design, Turczyn had a long career designing fabrics and learning precise color mixing and painting on gouache, two things she incorporates into her current work. During her stint in art school, Turczyn was struck by a car and struggled with a range of symptoms. She explains, "I've worked proactively on every level to regain my health and relate closely to the archetype of the Wounded Healer. I studied Reiki and other healing modalities because I wanted to be able to offer healing to people around me as well as to myself." Naturally, her two passions came together to combine art and healing into a single practice. "The Infinite Qualities series of floral mandalas came about in answer to two questions: 'How can my work benefit the greatest number of people?' and 'How can visual art support the healing process?' The circular, mandalic format represents integrity, interconnection and perfection. Each mandala convey s a quality essential to wellbeing: hope, vitality, compassion, unconditional love and creativity, among others. 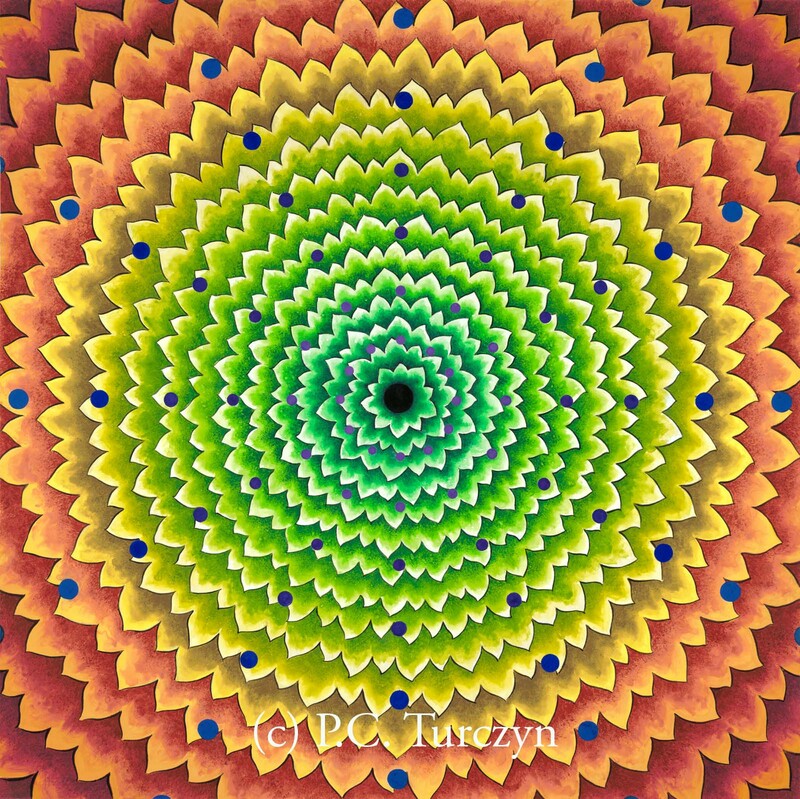 The mandalas are floral because initial Evidence Based Design research indicates that nature motifs have the greatest benefit for hospital patients. 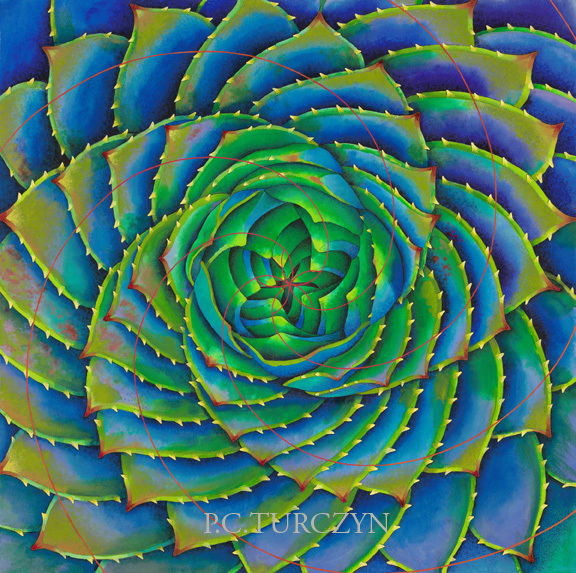 Sacred Geometry overlays reveal the order and balance found in nature, a source of comfort and inspiration." This current series, The Infinite Qualities series were created in gouache. Turczyn finds the medium to offer her the brilliant color and variety in opacity that she desires, as well as working smoothly with her designs and painting process. 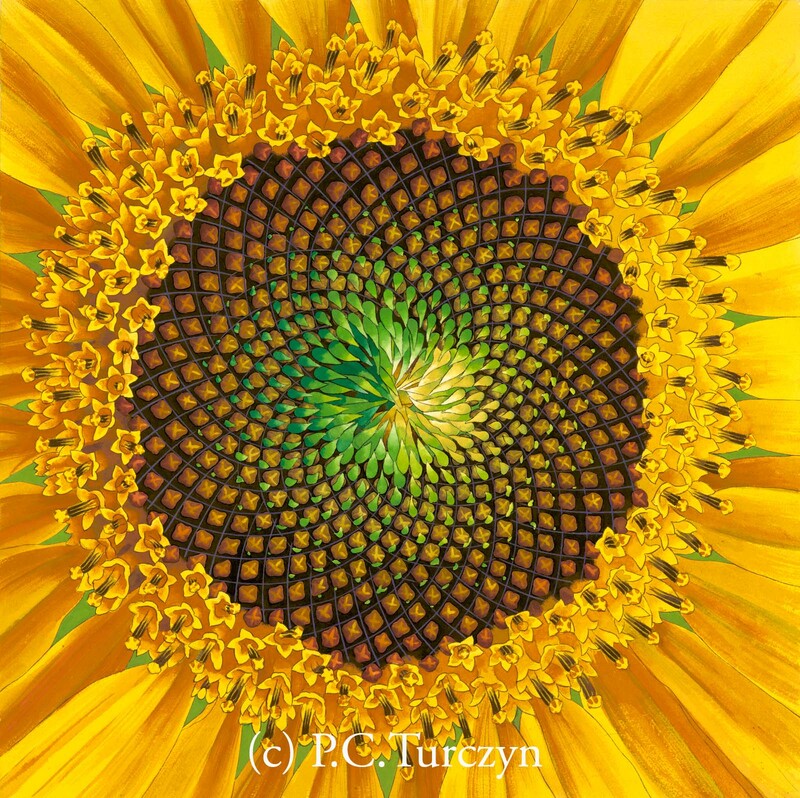 For much of her work, Turczyn enjoys round sables for the details and wide flats for the backgrounds, using fans for blending and bristle brushes for her dry brush effects. You can see more of Turczyn's work in person at the Omega Instititute show "The Quintessence: Three Visions” three person show with Janet Morgan and Alicia Hunsicker at the Ram Dass Library. It will open on April 20 and run through October. Turczyn will also be in a group show “Innovators and Legends: Generations in Textiles and Fiber” opening on May 24th at the Figge Art Museum in Davenport, Iowa.